If you recall, Nels was making the point that the sea level in Seattle has been rising at a steady rate of .68 feet, or about 8 inches, per century since 1898, as reported by the National Oceanic and Atmospheric Administration. As a reporter, I’m not inclined to shoot back a response. I’d rather discuss the issue with experts in the field. That is what I did, and I think I have a better handle on the issue. What I’m hearing is that the original estimates by the Intergovernmental Panel on Climate Change — a rise of between 7 inches and 2 feet by the end of the century — remain reasonable, but conservative given that they did not account for increased melting of the Greenland ice sheet. See this explanation by Stefan Rahmstorf soon after the release of the 2007 IPCC report. By the way, the range above accounts for the minimum and maximum across six climate-change scenarios. Ever since, researchers have been trying to find ways to account for the melting of the Greenland ice sheet, but the uncertainties remain high. A widely cited paper by W.T. Pfeffer, J.T. Harper and S. O’Neel suggests that “most likely” starting point for further refinement is .8 meter, or 31 inches, of sea level rise by 2100. In some ways, the authors of the Pfeffer paper were trying to limit some of the extremes being reported by others, so they concluded that sea level rise could not be more than 6 feet by 2100. Some folks have reported 6 feet as the top of the range, as unlikely as that extreme may be. Check out this explanation posed by Real Climate and this response by Pfeffer and his collaborators. “Other start dates either before or after this minimum show positive acceleration. Picking 1930 for this analysis is thus a classic cherry-pick, and according to the authors that is no accident. They write in the paper: ‘Since the worldwide data of Church and White (2006)…appear to have a linear rise since around 1930, we analyzed the period 1930 to 2010.’ The interval was thus hand-picked to show a linear rise rather than acceleration. I also discussed this issue of sea level rise with Lara Whitely Binder, outreach specialist for the UW’s Climate Impacts Group. While sea level rise means one thing on the world scale, she told me, the local impacts can be quite different. If you live in Neah Bay on the Olympic Peninsula, for example, you are not likely to see any sea level rise until at least 2080. That’s because the entire land mass is uplifting as a result of movement along the tectonic plates, and the uplift is predicted to be faster than sea level rise until late in the century. On the other hand, Central and South Puget Sound may not be uplifting at all and could be sinking, which would intensify the effects of sea level rise. Areas built on fill, including portions of Olympia, also could be sinking as the fill settles, Lara said. 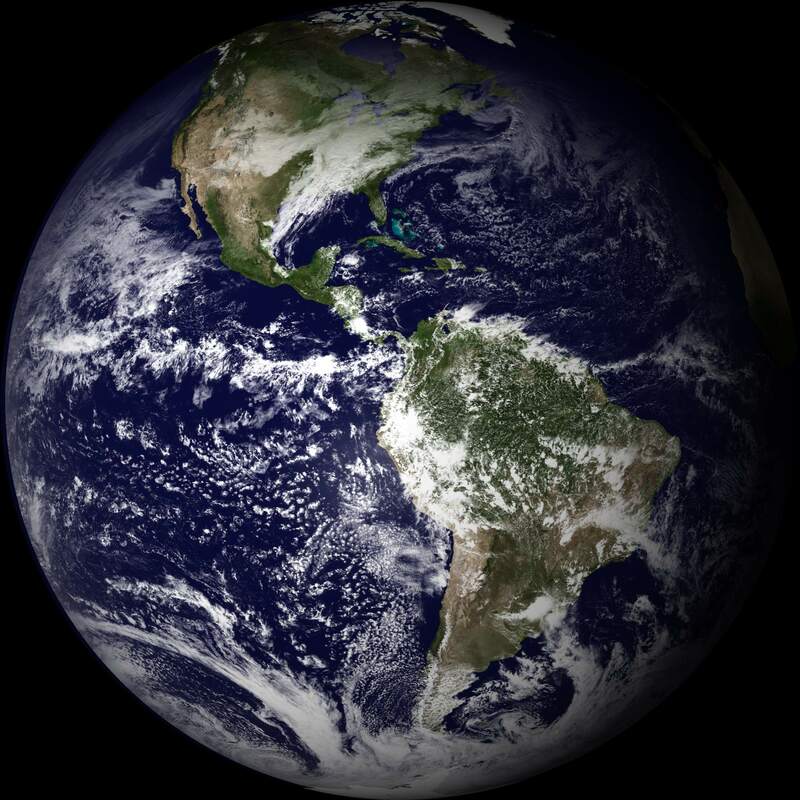 In addition to global rise in sea level and local tectonic shifts, factors affecting regional sea level rise include thermal expansion of ocean waters and changes in onshore and offshore wind patterns. During El Niño events, sea level can rise as much as 12 inches for several months at a time. 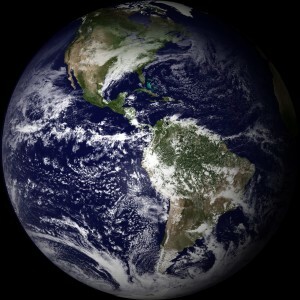 The Climate Impacts Group analyzed more than 30 scenarios from global climate models and concluded that the change in wind patterns as a result of climate change could decrease sea level by as much as 1 inch or possibly increase it by as much as 6 inches. 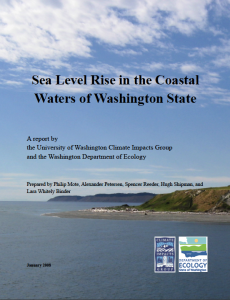 Review the white paper “Sea Level Rise in the Coastal Waters of Washington State” (PDF 2.4 mb) for more details. How much an individual property is affected by sea level rise depends on the slope of the beach. Given the same rate of rise, water will affect a house sooner when it is built on a gradually sloping beach as opposed to a steep slope. In any case, tides and weather will always play a major role in water levels. Lara told me that a group of West Coast researchers is working on a new report about sea level for publication later this year by the National Academy of Sciences. I’ll try to review that paper when it comes out. I wish to thank Eric Steig, Lara Whitely Binder, Cliff Mass, David Montgomery and Nate Mantua for responding to my inquiry. Thanks for your excellent follow-up with the real climate experts.